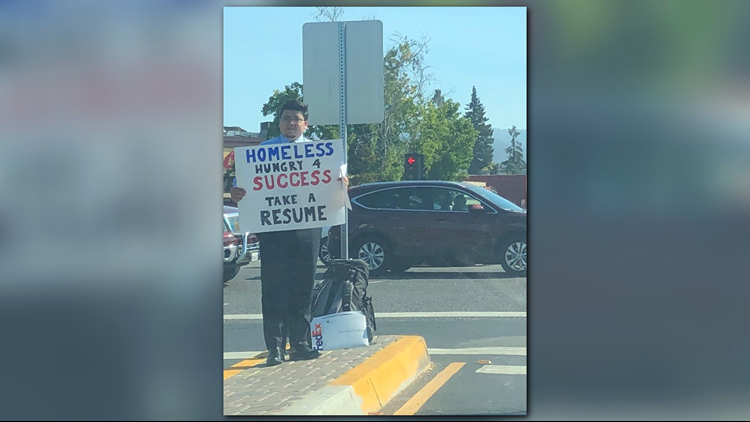 David Casarez says he's been overwhelmed with the outpouring of support he received after a picture of him holding a sign that said 'Homeless, Hungry 4 Success, Take a Resume' was posted on Twitter. A California homeless man is receiving an outpouring of support after a photo of him holding a unique sign was posted on Twitter. Jasmine Scofield saw 26-year-old David Casarez outside with a sign that read "Homeless, hungry 4 success, take a resume." She tweeted his photo and a copy of his resume and asked for any leads. "Please RT so we can help David out!" she said. Since Friday, the Tweet has been retweeted and liked more than 100 thousand times. Casarez graduated from Texas A&M University with a degree in Management Information Systems (MIS). After working for General Motors at General Motors for a little over a year, he left his job and moved from Texas to California to pursue his dream of working on a startup. "I know that Silicon Valley was the place to be if you want to compete with the big dogs," he said over the phone. Casarez had saved up some money, and planned to live off of his van to save money on rent. When his startup plans fell through, and he had about 4 months worth of savings left, he started looking for a job. He was interviewed to work at Apple, but was passed on for the position. Despite freelancing, Casarez ran through his savings, and his van was repossessed. That's when he began to think of a more innovative way of getting his name out. "I call it the power of broke mentality. You’re gonna do what you need to do to survive. That mentality kicked in," Casarez said. Casarez did not expect the outpouring of support that has come when he initially stood at an intersection in Mountain View, CA with his resumes. "I thought to myself, if I could get one person to take my resume that would give me hope," he said. Instead, he's gotten hundreds of emails with messages of support, requests for his resume, job opportunities and offers to house him. He's gotten messages from all over the world, including Saudi Arabia, Tokyo and Toronto. The messages are coming in so fast, Casarez can no longer keep up. "At first I was trying to respond, but I’ve fallen so behind. I’m trying to make sure everyone gets a timely response." People have also taken to Twitter to express their support for Casarez and others experiencing unemployment. Casarez hopes his story inspires others who are in the same situation to keep their hopes high. "Never give up. An opportunity is sure to come your way. Keep you head up high, and don’t be afraid to stand out. Don’t be afraid to be that pin drop in a hay stack," he said.